One touch connection joint for the polyurethane hoses. Rotary method which is easy for wrist.. It prevents twisting; therefore, drawing and winding are smooth. The plastic spring prevents folding. On separation, release the residual pressure gradually to reduce repulsion (Purge Plug only). 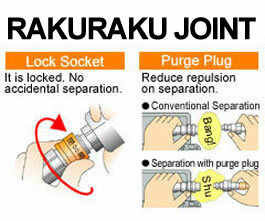 *Air Purge type: Gradually release residual pressure in the hose at joint separation to minimize hose recoil. * Compatible with “High Coupler” products from NITTO KOHKI. Note: Designed for use with air only. Do not use with other substances.